This is the next in the new series from AmeRRuss Blade Arts. It is styled as a Persian fighter with a mythical theme of the “Chimera”, an imaginary beast. The blade is forged from a four bar composite of radial twists by J.D. These yield a true “Herringbone” effect and are both flowing and visually arresting. 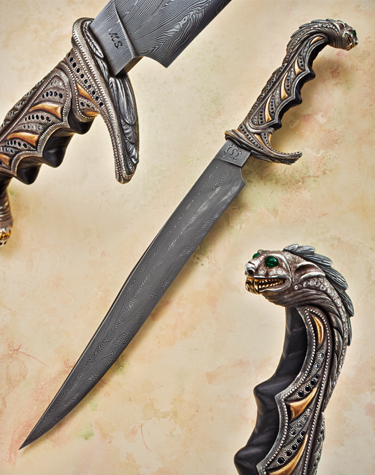 The hilt is a tour de force of art metal work by Joseph. He has carved from a solid piece of Sterling silver a mythical Chimera, complete with sea green emerald eyes and a Damascus steel dorsal fin down it’s back. Each scale on the creature’s back is set with a diamond. There are a series of gold panels that are offset with rows of diamonds and sapphires of graduated sizes all skillfully set in the “gypsy” fashion. The finger grips are of Black Cherry Burl from Russia. The knife is both beautiful and highly functional. Measures: Blade: 11" Handle: 5" Total Length: 16"